Under the theme of “Sensory,” we further explore sensory communication between the work of art and audiences. The works we propose in this exhibition offer compound sensations through interactions via sight, touch and sound. Those sensory experiences would directly move people to rediscover familiar materials such as metal, glass, wood, and ceramics. 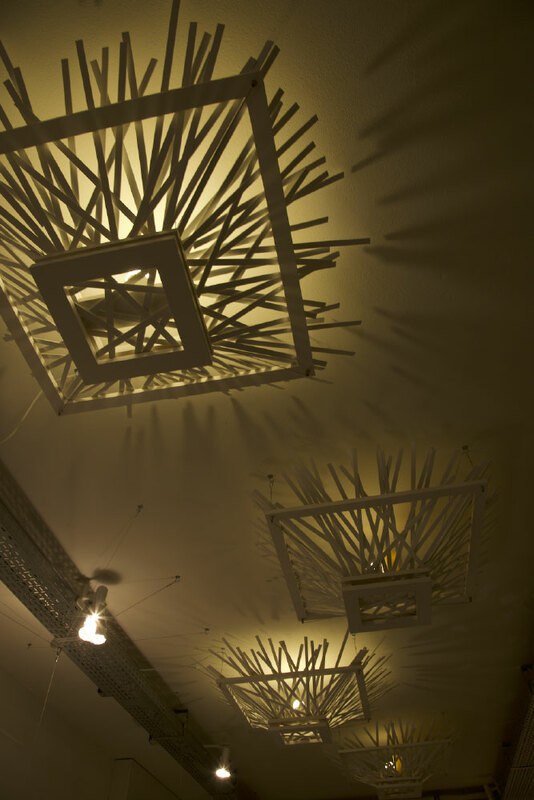 HASS is a lampshade inspired by the gentle appearace of lotus leaves floating on the surface of the water. It sways and gives a floating feeling as you touch it. 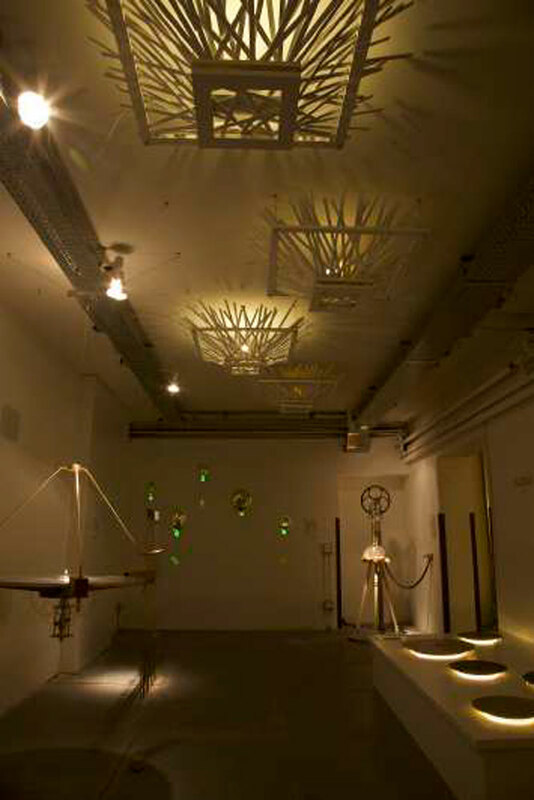 It is a lighting equiptment that spreads its light and sways as if it is floating when you touch it. Giving shape to parts by using the images that I've gathered as I dawdle my time away. Moving and recombining them as if the parts are drifting in my head. It is an object that you can feel the texture of wood and enjoy the dynamics of the magnets as it brings a feeling of floating. Please follow your inticnts and gently recombine them. The girl's shell is an innocent presence that you can't touch even if you want to touch it. An object of light is to experience the quality of evanescence. Please do not touch the LED light of electric cord style and the ceramic part in the middle, if it is possible because those are extremely fragile. Please swing lightly by touching the frame. In the twilight of white night, half awake and couldn’t distinguish between dreams and reality. Be taken to mystic another world by Rabbit, who is a guide. The distorted real world and ourselves are reflected in the balloon, and it looks as a real. The Rabbit is ourselves/viewers, who has appearance of child. Please look at the world projected on the mirror. In the universe of the water surface, blinks of moment are repeated like a miracle. Eternal and momentary cycle. The world starts to rotate as it plays records. When the disc is turned, the star on the board blinks and flickers. When a certain condition is met, there is a moment that the star, which isn't shine, blinks. Swaying and swaying, twinkling and glowing. As they clash they spark and make a sound. Visual sound, auditory light echo in space. When it happens, can we hear the light that is not seen, can we see the sound that isnot heard? Please swing the art and listen to the shimmering sound. In this work I show a certain scene of communication between man and woman by using different materials that express their iconic appearances and their individuality. I try to express the beauty in each character while contextualizing man and woman's unique features and functions with the materials. Please move the joystick up and down to insert the golden stick in and out of the lotion. The intangible is shaped out of tangible things. It exists only faintly, and remains transient. inviting fragments of nature to our everyday lives. that starts incensing the air, as if healing us in the faint scent. Resonance Materials Project aims at reviving our bodily sensations through encounter with materials and revisiting sensory activities related to weight, scale, touch, color, light, sound and so on, which are often alienated from our modernized life. The project also commits to the creation of places to liberate our sensibility through diversity, wit, and poetic moments in art. We endeavor to investigate the emergence of wow moments in such places and pursue the values of sensibility and sensations that would help us live humanely toward our future. Our goal is to explore ways of capturing an individual’s most impactful experiences, revealing their value and aiming to enrich the minds of our society. The research the realization and universalisation of the emotion which doesn’t have shape. Discover the concept of the emotional barrier and share social knowledge and try to make society rich with those emotions. By using our facilities and artistic skills, we collaborate on various types of projects with organizations outside of our lab. Our goal is to research the value of creation from different points of view and share our discoveries with the community. Thank you for taking the time to answer our questionaire. Q4 Did you enjoy interaction with the works in this exhibition? Q5 Did you feel the raw existence of materials through our artworks? Q6 Do you want to see more works from our RESONANCE MATERIALS Project? Q7 Did you see our previous exhibition in Fuori Salone 2018 in Tortona District? Q8 Did you have any inspiration from this project and want to change something in your own life? Thank you for taking the time to answer our questions. Please let us know what you felt from our exhibits.